To download or view this publication, please login or register. Underfloor heating can have design, comfort and economic advantages, and so it is not surprising that its use in new build homes has increased in recent years. 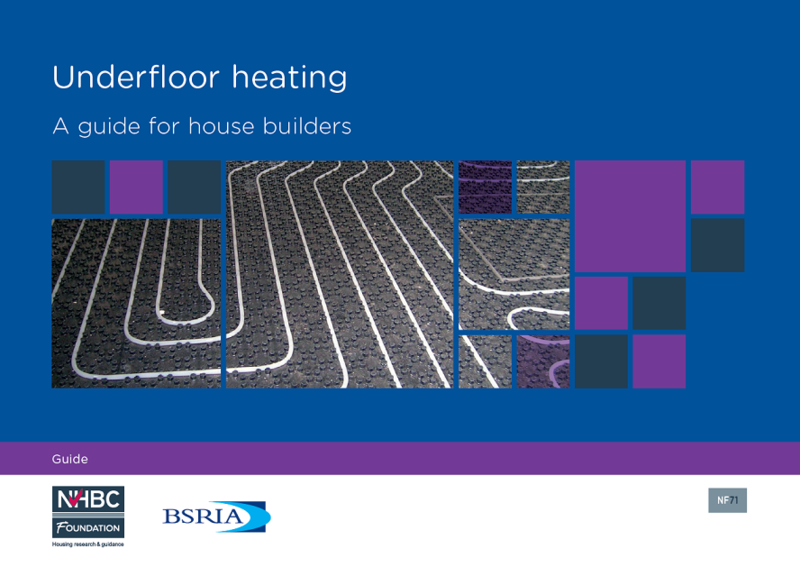 This guide sets out good practice guidance for those house builders and designers who are less experienced in underfloor heating but may be considering its use. The guidance draws on design insights from BSRIA and NHBC’s practical experience of underfloor heating installed in new homes, and highlights the key considerations during the design, installation and handover of ‘wet’ underfloor heating systems.By following the guidance, designers and builders can ensure that the performance of installed systems meet consumer expectations and provide trouble-free, convenient and efficient heating as part of the overall building services equipment installation within homes. Maintenance: underfloor heating systems are designed for easy maintenance. Describes the key components of an underfloor heating system and the main steps in the installation of systems in timber floors and concrete floors. Explains the heat sources that can be used with underfloor heating and considerations for each, including gas, oil and biomass boilers, heat pumps and community heating systems. Considers how systems deliver heating and hot water. Includes guidance and illustrations for concrete, timber, floating and acoustic floors. This section explains the Building Regulations guidance for controls and gives guidance on the using controls and settings for programmers. How to pressure test the installation and inspect for quality of installation. Includes notes on water treatment and maintenance checks of the manifolds. An introduction to what should be included in handover material/user guidance for residents and home owners. The NHBC Foundation is the research arm of the NHBC. NHBC is the UK's leading standard-setting body and provider of warranty and insurance for new homes. Signup to receive our regular newsletter that highlights our latest research findings and guides. NHBC is authorised by the Prudential Regulation Authority and regulated by the Financial Conduct Authority and the Prudential Regulation Authority. National House Building Council is registered in England and Wales under company number 320784. NHBC's registered address is; NHBC House, Davy Avenue, Knowlhill, Milton Keynes, Bucks, MK5 8FP. Simply add your details below for ongoing access to downloads. Simply enter your e-mail address if you have previously registered to download publications.